They say you can never go back. But you totally can. I just returned from a trip to my Past. Well, okay, it was really just a trip to Washington, DC. But since I lived there off and on for 20 years, it feels like the Past. And the Present. And some little bits of it are like the Future. Stepping off the plane at National Airport (it wasn’t named after Ronald Reagan when I first lived there–he was just in his second term at the time–so it’s always going to just be National or DCA to me), I felt that immediate stressful hunch return to my shoulders. My face dropped its smile and my feet moved purposefully. It’s the city. I immediately and subconsciously adopted the City Attitude. 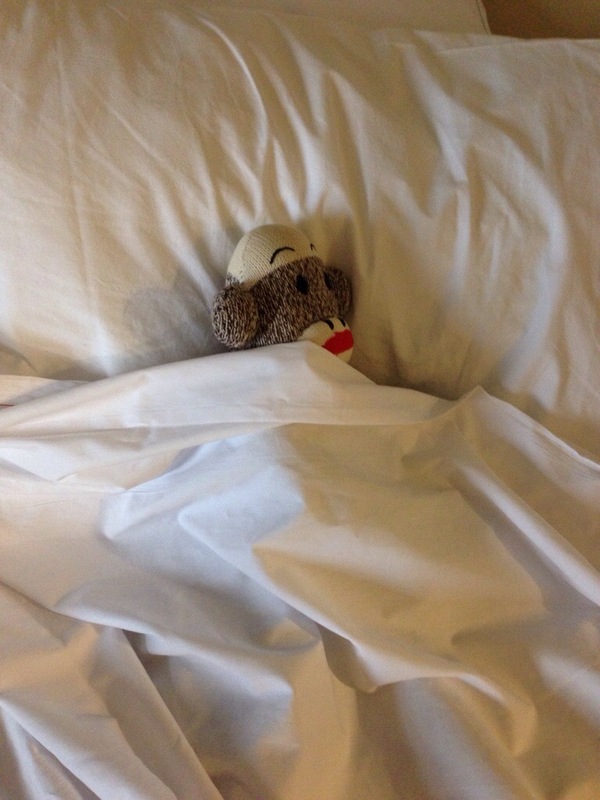 My travel companion, P. Monkey, loves sleeping in hotels. When I’m in D.C., I truly struggle to maintain my identity as Present Tyra. I shift in and out of dimension like someone caught in a time-space continuum anomaly in Star Trek. I get on the Metro train and have to consciously force myself to stay seated as the train passes the Pentagon Metro stop (from which I commuted for several years) and the Foggy Bottom stop (yes, it’s a real neighborhood name–go ahead and smirk, I still do) where I worked for several years. The memories flood back–college (not so good), working at the Key Bridge Marriott (awesome), various restaurants and points of interest that are tied to good (and bad) memories. And yet I’m there on business. I’m Present Tyra. Phase shift. There are some wonderful things about the city. I love “city walking.” Block after block of concrete, interesting characters (who I pretend not to notice as I adopt the disinterested blank face of a city dweller), the fabulous and diverse restaurants (disregard that I ate in the hotel two out of three nights of my trip). I love the way the city landscapes its tiny green places. And the street musicians who play and to whom I always give money because in my mind, they are providing a service to the community. I do not, however, miss the traffic, the noise, and the sadness I feel when I see all the homeless and panhandlers. And I don’t enjoy the pace–the frenetic hurry-hurry self-important attitude of everyone except the tourists. 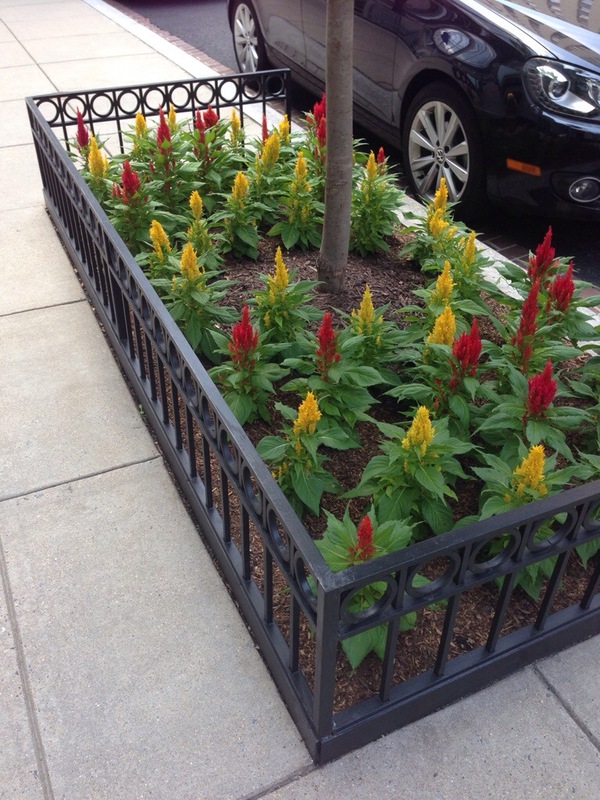 Colorful green spaces in the midst of concrete. Beautiful in their contrast. Being in the Past reminds me of how far I’ve come in my life. From an insecure small town girl heading off to the Big City for college to…well, to the small town woman who recently returned home after 20+ years to the only place I’ve ever loved. It’s nice to visit the Past, in part because it makes me appreciate my Present. It also makes me appreciate the Past and all its players who played a part in getting me to where I am, Home at last. I’ve had a lot of jobs in my life. A LOT. And I recently gave notice at my current J-O-B (a year’s notice – academia is kind of weird). I love my J-O-B, but I love flexibility, freedom, variety, and the beach more (we’re finally moving back “home” to the coastal town where I grew up and my husband went to high school. I’ve been trying to do that for 20 years). Kind of makes me dizzy to look at it visually. And that’s just since I’ve been an “adult,” so the list doesn’t include various restaurant and retail jobs I had in high school and college. Here is my career path visually (including various periods of unemployment…which were actually great fun, but that’s another story for another day). I worked my way through school (all of it), so those aren’t “breaks,” btw. My life span in a J-O-B (by that I mean conventional employment) is about 3 years. I’m going on Year 4 in my current J-O-B. I must be growing up. HA. Just kidding (SO just kidding). A lot of people think I’m crazy. Or flaky. I have a great J-O-B at a great university in a lovely small city, I love my students, I get summers off, and it’s as close to entrepreneuring-with-a-regular-paycheck as you can get. I’m not crazy (well I am, but not because of this). I’m not flaky. I just know I’m meant to live a different way–and a different where. Even though I’ve done a lot of things, there many more things I still want to do. After all, I’m only in my 40’s and have many more working years ahead of me. So I recently made a big decision: never to have a J-O-B again. I don’t mean that I get to retire early. I’m not wealthy. And for better or worse, I married for love, not money. (Just kidding, honey, it’s better!) I have just realized that a J-O-B is simply not my style. 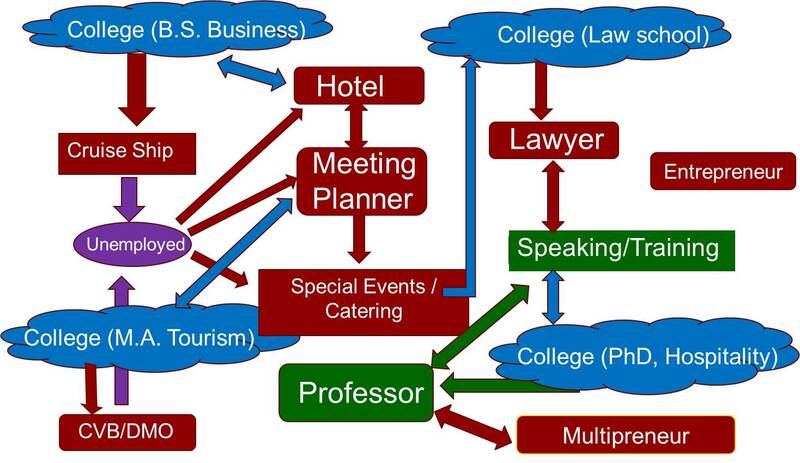 Instead I’m going back to “multipreneuring,” which is like “entrepreneuring” but doing several things at once. For example, my last multipreneur gig had me speaking, teaching, and lawyering…in various proportions that fluctuated by day, week, month, year. And doing other cool stuff when it came along like consulting and writing. This idea is not mine. I’ve been collecting books for years that talk about living this life style…er, work style. And it fits me better than any J-O-B ever will. I’ve shared this with various people in presentations and I recognize the kindred spirits when I see their eyes light up like lightning bugs on a summer night. So I thought I would share a short bibliography of books to read if this idea interests you. Enjoy. Carpe your J-O-B, job, or whatever works for you! Tom Gorman. (1996) Multipreneuring. (This one may be out of print). Richard J. Leider & David A. Shapiro. (2002). Repacking Your Bag: Lighten Your Load for the Rest of Your Life. Barbara Sher. (2006) Refuse to Choose: A Revolutionary Program for Doing Everything You Love. Barbara J. Winter. (1993). Making a Living Without a Job: Winning Ways for Creating Work That You Love. Cali Williams Yost. (2004). Work + Life: Finding the Fit That’s Right for You.